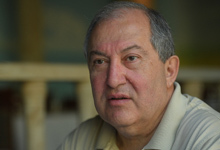 President Armen Sarkissian gave an interview to the RIA Novosti and Sputnik-Armenia news agencies. Mr. President, you have arrived to Moscow to watch the finals of the World Cup. In your opinion, how was the Mundial organized? In my opinion, the World Cup in Russia was sensational. I would like to congratulate the President of Russia and all organizers of the tournament: This football fest was wonderful. I am telling this as a person who feels very close to Russia and who has watched the last three Mundials – in Africa, Latin America, and Germany. I didn’t see anything like the atmosphere in Russia even in Brazil which is famous for its carnivals. It was a fest, jolly people on the streets, everything was organized very well, not a single incident, totally safe and, at the same time, the presence of the police on the streets was muted. I believe today the important thing is that the tournament has allowed the world to see the real face of Russia. Unfortunately, today, in the 21st century, virtual reality often obscures the true image of things. But now hundreds of thousands of fans and journalists from all over the world have had the opportunity to see and understand the real Russia. In general, I should say that football is a huge part of my life. I spent my young years in Yerevan, and when in 1973 Ararat team from Yerevan became the USSR champion and won the USSR Cup (in 1973 and 1975 – ed.) you can hardly imagine the joy and jubilation all over Armenia. Lately, our family cheered for London’s Arsenal, and now we are particularly happy to see that the best Armenian football player – Henrikh Mkhitarian is playing there. Whom did you cheer for in the finals? France. And there are multiple reasons for that. First, I like that team. Second, in the previous French team, which became the world champion twenty years ago, two Armenians were playing – Djorkaeff and Poghossian. Third, relations between Armenia and France are very close and amicable. France is a country, which at the beginning of the last century gave refuge to a vast number of Armenians, a country, which has recognized the Armenian Genocide in Turkey. Besides, there is evidence that the last Christian King of Jerusalem was half-Armenian, half-French, while the last King of the Armenian Kingdom of Cilicia also was half-Armenian, half-French. Finally, currently Armenia is a member of Francophonie, this year Yerevan will host the Summit of the International Organization of Francophonie. And for me personally, not to cheer for France, especially on the eve of the Summit of Francophonie, would be difficult. In general, no team has had dominated in this tournament, as it used to be. The title of champions was contested by a number of teams, including the Russian team. Before the finals, we discussed the issue with partners. Russia has always been perceived as a country of great hockey. But now, I believe, it has also become a great football country; the players have become heroes in Russia, role models for youngers. Many anticipate that your ties to the political and business elite in different countries will attract additional investments to the country. Are there any deals yet? In a parliamentary republic, the role of president doesn’t imply any leverages in the executive branch. It was clear from the very beginning that if I took that position, I would use my connections in the areas of science and politics to attract investments to Armenia. Currently, the general mood in Armenia is positive. Changes that are taking place after the Velvet Revolution are perceived by many as positive. Changes for the better are largely expected, and it is important that the changes translate into tangible results in economy, in business. My point of view is the following: Today we have a huge advantage because we are a member to the EUEA. And when I say invest in Armenia, it doesn’t mean I am urging to invest in the country with the population of 3.5 million people. Armenia may become a bridge or a gateway to the vast Eurasian market which has the population of 175 million people. Nowadays, when natural resources are not as important as new technologies and innovations, Armenia can put the stress on these. In Armenia, technologies are developing very well and many global companies of that area are working in our country. Armenia may become a technological bridge between the provisory West and East, create its own new technologies of international quality and spread them at the Eurasian market. Recently, I’ve visited France and met with a number of representative of French companies, such as Dassault Systèmes, Orange, THALES. The meetings took place not only with high-tech companies but also with the owner of Chanel. Jewellery making traditions in Armenia are strong and would be nice to bring together out traditions and global technologies. After the revolution, the repatriation processes in Armenia have become more active. Are you ready for the return of tens of thousands peoples to the country, are there jobs for them? For instance, Syrian-Armenians, have they been able to adapt at the historical homeland? It is true that now a great inflow of people is underway. Creation of attractive programs for the repatriates is the prerogative of the government, the executive authorities. Naturally, there will be full support from my part, there also will be presidential initiatives. What steps are necessary here, beside investment programs? It is important to have a normal atmosphere in the country; no corruption, normal functioning of the courts, so that people can trust that their problems will be dealt with in the framework of the law. A lot is being done in that area. Many of those who came from Syria because of the war have lost literally everything. They moved to Armenia and started from zero. They don’t want to leave, Armenia is not a transit point for them, they want to live here. What do you think is necessary to do to keep the young people from leaving the country right after school graduation? This too, is mainly in the realm of the executive authorities. However, at the same time I believe in the contemporary world you cannot confine anyone anywhere. On the contrary, it is necessary to create conditions for the young people to study in Russia, in other countries, in the best universities of the world and then come back home and never lose ties with Fatherland. For Armenia, the model is clear – small country, but global nation. Mind you, Diaspora is Armenia’s greatest advantage which means strong Diaspora – strong Armenia. By the way, the largest Armenian Diaspora resides in Russia and is the closest to us – physically and spiritually. Have you preserved your personal interest towards theoretical physics which was your profession before entering politics and how experience from the scientific life helps you in your new status? I have certainly preserved the interest. The areas, which I was engaged in – the theory of relativity, astrology, relativistic astrophysics, are dealing with the exploration of the universe, the world, and through scientific knowledge we get closer to the truth and understanding of God. The deeper we comprehend the laws of physics, more often we discover the absolute precision and the absolute beauty. What has science given me for my current job? First of all, mental discipline. Second, regardless of what you do – science, business, or politics, sound reason and logic are very important. It is also very important to have an inner feeling what the solution of the given problem should be. I call it a vision. Then, calculation of the methods, programs and concrete steps for reaching the solution, up to real goals. Nowadays, many of the world leaders are using social networks to stay in touch with the public. Do you employ that mechanism? First of all, in our times social networks have become an absolute reality. Political leaders, who understand which way the world is going, will have the advantage. But president in the parliamentary republic has not administrative functions and there is no need to explain daily to the people my moves. Thus, at this stage I have not blog in social networks, I simply don’t feel the need. Our Prime Minister and government use social networks actively, and I think it is right: The people should know why this or that decision has been made. In general, after constitutional changes in Armenia, we still have to learn to live in a parliamentary republic. We don’t have traditions of parliamentary republic, those are to be created, we will learn from the countries where that kind of governance has been established long ago.